Rachel and Mel share a passion for baking. Their businesses are moving forward together. It’s a match made in culinary heaven. The union of mystical cupcakes and marvelous macarons. 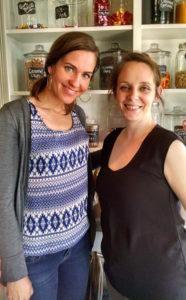 Rachel Young, owner of Miss Moffett’s Mystical Cupcakes, and Melinda Gagnon, owner of Macarons by Mel, are teaming up. All three retail locations for Miss Moffett’s have made room to display this beloved French delicacy. Every colorful treat, cupcake or macaron, is gluten-free. Both Young and Gagnon bring the energy of youth and determination to create original recipes that delight the palate. There’s love in every bite. Miss Moffett’s Mystical Cupcakes and Macarons by Mel can be mixed and matched. It’s likely you are already a fan of, or at least familiar with, Miss Moffett’s Mystical Cupcakes. Young, a self-named cupcake-baking addict, draws continual inspiration from her great-grandmother Rachel Moffett. “She was a sweet woman,” said Young. Known as Miss Muffin, great-grandma was loved by her Hillsboro, Texas community for her caring spirit and wonderful cupcakes. This was long before cupcakes were trendy. The baking tradition continued through Rachel’s mom. Although the recipes are not specifically from her great-grandmother, Young is dedicated to a legacy of spreading those same good feelings around the world. Melinda (Mel) Gagnon has been living in Olympia only since last year. Her husband was finishing his service in the military and wanted to return to his hometown of Tumwater. Mel had previously served five years in the Navy. She packed up the family along with her macaron baking skills, learned at a shop in Savannah, Georgia. Her goal was to get a business going here which she did initially without a storefront. She gave out many samples and hoped to expand. After several unsuccessful attempts to meet Rachel behind the counter at her mall store, Mel went to the downtown store. The next part sounds like a scene from a movie. Macarons in hand, Mel made her way with a double stroller packed with two very young children into Miss Moffett’s near the Olympia Farmer’s Market. Rachel recalls that it was a little like “love at first sight.” She saw herself in Mel – just a few years earlier, doing whatever it took to move her business forward. Then, she tasted her macarons. They’ve been friends ever since. The possibilities of combining their talents and businesses began to unfold. It was a perfect way to expand the bakery options with a popular specialty product. Macarons are colorful, delicate treats with infinite flavor combinations. Made with almond flour, they are naturally gluten-free. Macarons are easier to package than cupcakes. And, most importantly, Mel’s were delicious. 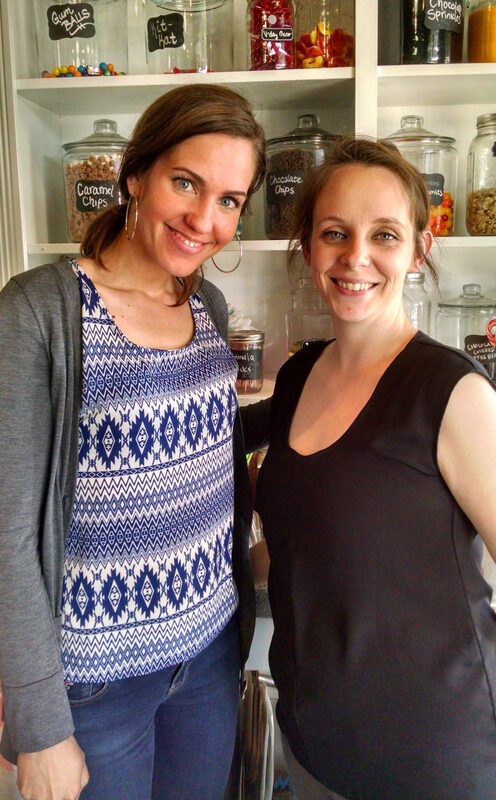 Both business owners have three young children and Mel is expecting her fourth. That hasn’t prevented them from experimenting and testing a crazy number of taste combinations. Rachel estimated she has 250 different flavors. Mel started with thirty or forty, but is up to a hundred. She searches for complimentary colors and flavors to pair with the cupcakes. There’s a new pink one with sprinkled confetti. It’s mindful of the frosted animal crackers many of us remember. “It feels like childhood,” remarked Mel. Match your mood to your cupcake choices. The raspberry/coconut remind me of a cake from my grade school days. 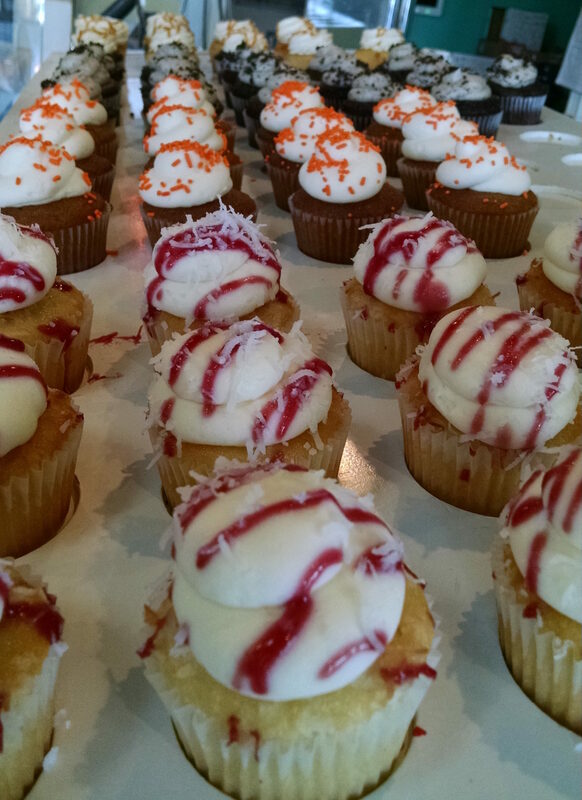 Over time, Rachel has perfected her recipes so each cupcake is flavorful and moist. 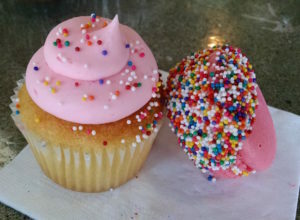 Classic flavors such as vanilla or chocolate birthday and carrot cake are available daily. Each day of the week offers three different rotating flavors, which means you need to plan ahead if you want to get lemon sunshine or chocolate raspberry cheesecake. There’s no moss under these women’s feet. In April, Young was selected to fill a position on the Lacey City Council. She will run for election this fall. Community involvement has always been a hallmark for her. For example, through the end of September, 25% of the sales from the Great Futures Cupcake (vanilla or chocolate with ‘blue raspberry frosting’ and rainbow sprinkles) will go to the Boys and Girls Clubs of Thurston County. Miss Moffett’s has supported numerous local events and non-profit organizations like Pizza Klatch and the American Cancer Society. Gagnon is enthused to be more deeply involved in community activities. Plans for future expansion are also underway. 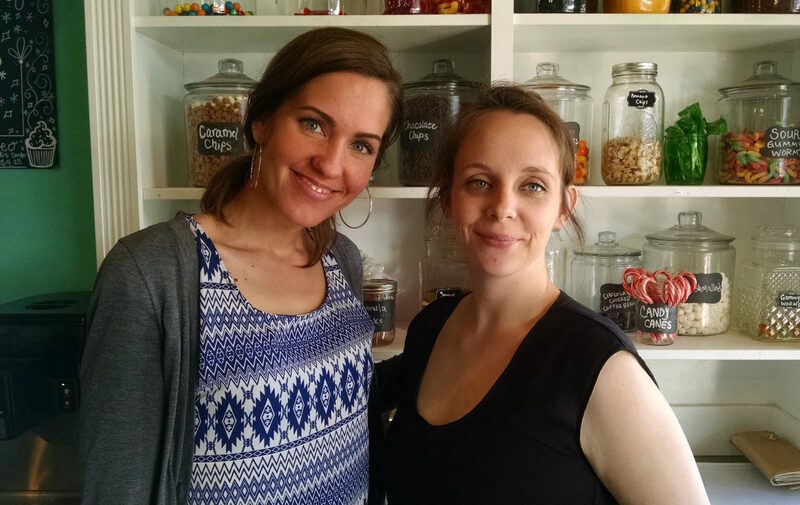 Rachel Young and Mel Gagnon are sharing a kitchen and a vision with cupcakes and macarons. Both are discerning about the quality of their ingredients. Everything is made from scratch, including the caramel in the macarons. Mel makes 1000 macarons a week and is increasing production. Rachel bakes about 15,000 cupcakes a month and every one is special. You can even frost your own when you arrange a special event. Did you know mini-macarons made a perfect topping for a cupcake? It’s true. Feeling hungry for a marvelous, mystical moment? 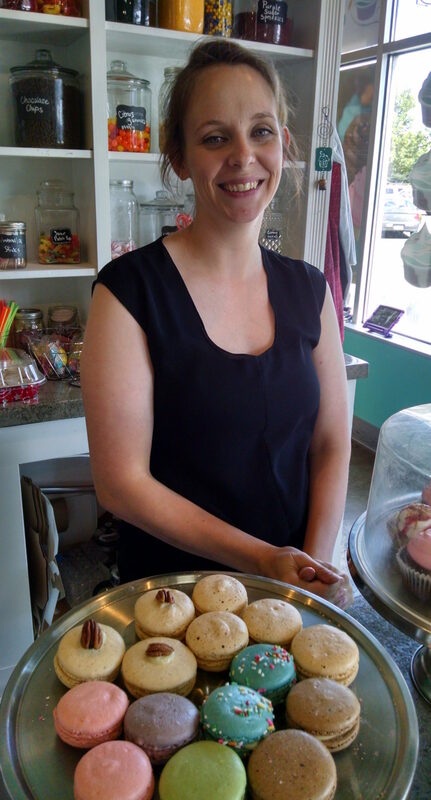 You can find cupcakes and macarons (and cinnamon rolls, too) at the downtown Olympia location across the street from the Olympia Farmer’s Market, in Lacey inside Elle’s Floral Design or at the westside Capital Mall. The Eastside Co-Op has them on hand, too. You can order online, as well. Order cupcakes here and macarons here. Select dozens for your wedding, birthday party or any occasion, or stop by to select a single one for personal enjoyment. ‘Because’ is the only reason you need.